The public feuding between Israel and Washington ratcheted up sharply on Tuesday amid claims that Barack Obama has declined to meet Binyamin Netanyahu during the Israeli prime minister’s visit to the US later this month. Haaretz reported an Israeli official as saying that Netanyahu asked for a meeting with the president after attending the opening of the UN general assembly in New York in late September. Netanyahu offered to travel to Washington but the White House allegedly said Obama was too busy. Israeli officials confirmed that version of events to other reporters. But the White House denied any intentional snub of Netanyahu, saying that the president was not able to meet the Israeli leader in New York because the pair would not be in the city on the same day. It also said Netanyahu did not request a meeting in Washington, “nor was a request for a meeting ever denied”. 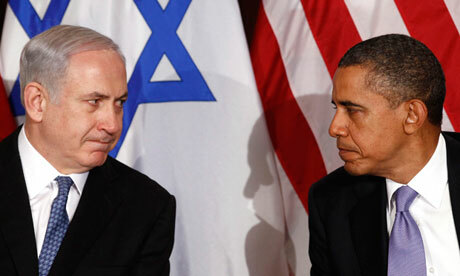 However, Israeli officials continued to assert in private that Obama appeared to have snubbed the Israeli leader. It will be the first time Netanyahu travels to the US as prime minister without seeing Obama. The perception of deepening strains was reinforced by an undiplomatic warning to the US from Netanyahu on Tuesday over Iran‘s nuclear programme which prompted suspicions in the Obama administration that the Israeli leader is dabbling in the American election campaign. It also resulted in an hour long call from the president to Jerusalem although the White House released little information about what was said. Netanyahu said other countries have no moral right to block an Israeli attack on Iran’s nuclear facilities if they are not prepared to set firm “red lines” for Tehran, including a deadline for it to meet western demands for a halt to uranium enrichment. He did not name the US, but that is where the warning was aimed. He disparaged economic sanctions against Iran as ineffective, saying that Iran is getting closer every day to building a nuclear weapon. Netanyahu’s comments came in response to a statement by Hillary Clinton, the US secretary of state, who at the weekend rejected Netanyahu’s calls for red lines, and said sanctions and diplomacy need to be given time to shift Iran. The Israeli leader’s public challenge to Obama over Iran was taken badly in Washington. The White House said of the president’s call to the Israeli leader only that the two “are united in their determination to prevent Iran from obtaining a nuclear weapon, and agreed to continue their close consultations going forward”. But there is a suspicion that Netanyahu is seeking to use the US election to bounce Obama into committing to early military action against Iran or is trying to influence Jewish American votes in favour of the more hawkish Republican candidate, Mitt Romney by suggesting the president is jeopardising Israel’s security. Netanyahu only recently pulled back from months of threatening rhetoric over an attack on Iran, under pressure from the US and Europe â€“ including, it emerged on Tuesday, a highly unusual visit two weeks ago of the head of the British intelligence service MI6, Sir John Sawers, as a special envoy from the prime minister, David Cameron. In meetings with Netanyahu and his defence minister, Ehud Barak, Sawers reinforced the message from Washington that an attack on Iran in the near future would only complicate attempts to dissuade the country from developing a nuclear weapon. An Israeli official source told Haaretz that British fear of an imminent Israeli strike was heightened by Netanyahu’s failure in a phone call with Cameron “to provide clear and precise answers” to questions about Israeli intentions. As it toned down the rhetoric, the Israeli leadership sought guarantees of US action if Iran failed to meet western demands – the so-called “red lines”. But Washington has refused to agree. The US defence secretary, Leon Panetta, further angered the Israelis by saying there is still more than a year to prevent Iran obtaining a nuclear weapon. He also contradicted Israeli claims that Iran had already decided to build an atomic bomb. Israel’s defence minister, Ehud Barak, sought to cool tensions on Tuesday, at least in public, by saying that differences should be sorted out “behind closed doors”. “We must not forget that the US is Israel’s most important source of support in terms of security,” he said. Last week, the chairman of the House of Representatives intelligence committee, Mike Rogers, described attending a “very tense” and argumentative meeting between Netanyahu and the US ambassador to Israel, Dan Shapiro, in late August at which the pair had “elevated” exchanges. Rogers described Netanyahu as at his “wit’s end” over Obama’s refusal to set red lines for Iran. Rogers said Israel will probably bomb Iran if the White House does not lay down firm limits for Iran. Shapiro rejected the characterisation of the meeting. A former senior Israeli foreign ministry official and diplomat who served in the US, Alon Liel, said Netanyahu engineered the confrontation in front of Rogers. “It appears to be an attempt to help the Republicans in the upcoming election. The entire show, under the patronage of Rogers, is meant to prove to the American public, and in particular to the Jewish community, that the rift between Israel and the United States is more significant and deeper than we thought,” he wrote in Haaretz.